Pricing subject to change. Promotional pricing not valid on previous purchases. Call 402-730-7646 for most up-to-date pricing. 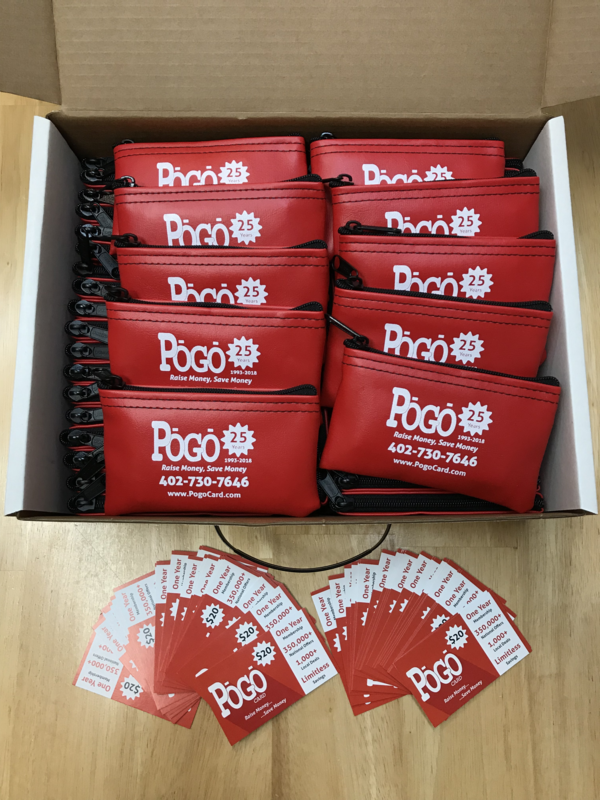 Groups, organizations, and individuals in Lincoln have trusted the Pogo Card (and now the Pogo App) for their fundraising and money-saving for over 25 years! Organizations selling the Pogo Card keep 50% of every sale, making it an extremely profitable fundraiser. Right now, organizations make $10 per sale! Fundraising with the Pogo Card is simple! Organizations purchase cards and resell them. No waiting for disbursements or meeting fundraising thresholds! The Pogo Card benefits both customers and the organizations. Groups keep 50% of each sale and their supporters get access to unlimited savings opportunities! How do I start a Pogo Card fundraiser? How soon can I start a fundraiser? When do I pay for the Pogo Cards? To begin a fundraiser, simply submit a “Get Started” form, email us at info@pogocard.com, or call us at 402-730-7646. To start a fundraiser, we’ll need your name, your organization, a billing address, and a phone number. Unsure how many Pogo Cards you should purchase for your fundraiser? We’re happy to help decide which fundraising products and quantities are the best fit for your organization. In most cases, once you’ve contacted us, your fundraising order will be ready for pickup at our office within 1-2 business days. Once you’ve started a fundraiser with the minimum quantity (or more), additional Pogo Cards or Pogo App activation codes can be purchased in any quantity. Payment for all Pogo Card fundraising purchases must occur when the products are picked up from our office. Organizations then resell the cards to recoup their costs. Unless special circumstances exist, consignment selling is not available. After organizations have purchased the minimum quantity of Pogo Cards to start a fundraiser, additional cards or Pogo App activation codes can be purchased in any quantity. Promotional pricing will not be retroactively applied to any purchases. Interested in getting started with a Pogo Card fundraiser? Contact us for more information and we’ll respond with answers to any questions you may have or details regarding your fundraising order.